THANK YOU FOR YOUR INTEREST IN A PARTNERSHIP WITH ME. I help companies to stay ahead of the competition – tapping new markets, innovating and flouting traditional modes of thinking – all strategies that require you to break free from the status quo. And when we partner, you can always rely on me to facilitate your business growth. Through RubberMachineryWorld.com, I provide authentic information on various aspects of machinery, feature suppliers, innovation and technology. These information equip buyers in the global rubber and tire industry to wisely source the right machinery. Simultaneously, this portal also provides a platform for equipment suppliers to display and communicate their products to reach their equipment buyers quicker. YOU SELL MORE WHEN YOUR POTENTIAL BUYERS VISIT MY SITE FOR AUTHENTIC INFORMATION ON MACHINERY AND SEE YOUR BRAND PRESENCE ALONGSIDE. SO WHY NOT WE PARTNER AND YOU SELL MORE? 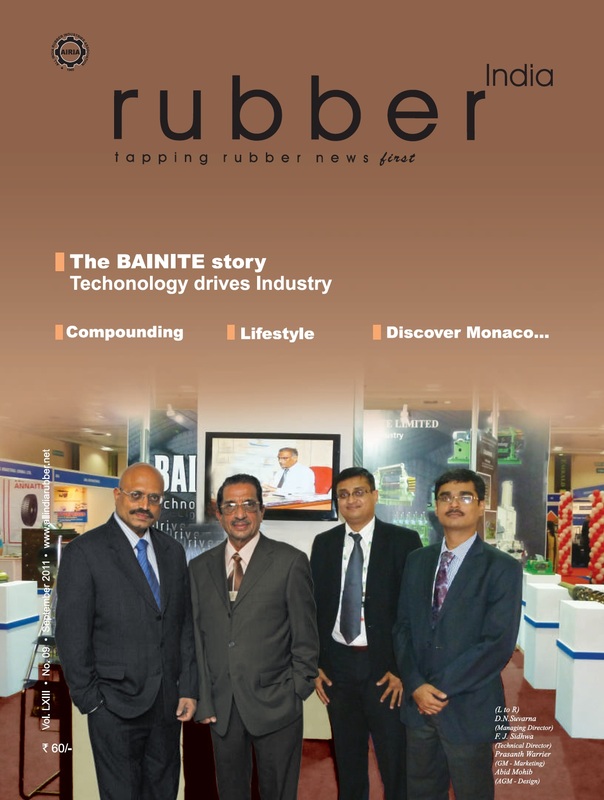 As the CEO of Bainite Machines, I have been regularly writing on machinery and featured in various rubber journals. Leading magazines like Tire Technology International has published my interviews and I have appeared on the cover pages of Rubber Asia, Rubber India, among a few. My blog is accessed by a very niche segment of targeted stakeholders in the rubber industry (here are few recent Testimonials). I help you reach out to your buyers on a regular basis with advertising solutions. SHOWCASE YOUR BRAND 24×7 ON RUBBER MACHINERY WORLD. Here’s how I can help you. I offer Standard Online Banner Ad and customized solutions like Advertorial, e-Newsletter, e-Direct Mailers, digital editions and product reviews. These are effective and innovative brand promotion solution to increase your market share and generate positive results. It gives your brand 24×7 visibility, global reach, increases ROI and product positioning. I also help you sharpen your company presentation, marketing collateral and sales training to increase your brand appeal. More customized solutions (for example, technical seminars and training on behalf of your company) can be discussed in detail when we meet or speak. To know more on my updated media kit, please contact me or email me on rubbermachineryworld@gmail.com with your marketing goal. We are manufacturer of Vulcanisation Autoclave. Hi. Thank you for the Twitter follow. My business is an agent / reseller of Machinery & Consumables to the Rubber Roller / Sleeve & Hose Markets. Is this an area that is covered by your publication? My pleasure. I have sent an email separately.